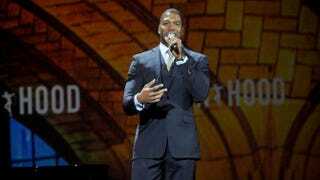 Michael Strahan speaking at the Robin Hood Foundation’s 2014 benefit at the Javits Center on May 12, 2014, in New York City. Police arrested a man with a knife outside ABC studios Tuesday morning after he claimed he was there to "kill Michael Strahan," the New York Post reports. According to sources who spoke with the Post, Andre Johnson, 25, was outside the Good Morning America studio around 8 a.m. when he flashed the knife in front of a security guard. A police officer, who was working a security assignment with ABC Studios, knocked the knife away from Johnson. Johnson would later tell police that he was "there to kill Michael Strahan," the Post reported. Sources told the Post that the former NFL star-turned-talk show host was not aware of what had happened until late Tuesday afternoon. "It was a scary situation, but thanks to the fast actions of NYPD, the situation was quickly under control," a ABC News spokesperson told the Post.